Young drivers with little road experience are a significant cause for the horrifying road toll, the Automobile Association said this week. Police were also blamed, with a top transport expert declaring that police had no effective strategy for attacking the causes of road accidents and merely reacted to individual accidents. AA Secretary Devapriya Hettiarachchi said driving licences were being issued to young people without proper training, “If you take most of the recent accidents, many drivers are young people with less than five years’ driving experience after getting their licence,” he said. He noted that in Japan, when a driving licence was issued, the driver had to exhibit a sticker on the windscreen so that other drivers would know s/he had only recently obtained a licence. This practice created vigilance among other drivers. The AA chief urged that similar methods be adopted in Sri Lanka. 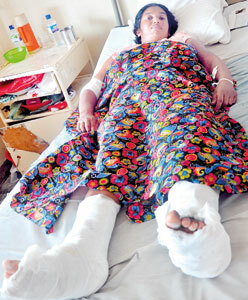 Mr Hettiarachchi said the spate of private bus accidents was also largely caused by driver inexperience. “Most private bus drivers are 25-28 years of age and have limited driving experience,” he said. “We believe this is the main reason for the increase accidents involving private buses. An expert in transportation, Professor Amal Kumarage, said police had no strategy in dealing with the causes of traffic accidents and were simply reactive. “Accidents have patterns, causes, reasons. Accident prevention must identify these reasons and target law enforcement at such causes. The police are, in most instances, unable to catch the most dangerous drivers on the road. They have no strategy that works effectively,” Professor. Kumarage said. “Speed alone is not the cause for accidents. Dangerous overtaking and aggressive driving coupled with unsafe speed are mostly responsible. In one of several accidents this week that reinforce Professor Kumarage’s views, a 32-year-old man traveling from Veyangoda to Kataragama was severely injured when the three-wheeler he was travelling in swerved desperately to avoid a lorry overtaking at speed, and toppled off the road. “We had only a little space on the road to stay clear of the lorry,” said vegetable trader Manjula Sampath, who is in hospital with injuries to his head, neck, hip, hands and leg, multiple fractures and internal injuries. He said the lorry driver had been speeding from a long distance back and had been trying to overtake other vehicles as well. Professor Kumarage said truck drivers, particularly tipper trucks and bus drivers, caused a high number of road accident deaths. “These are vehicles where drivers earn their income by the number of trips they make, so they speed and often compete with others on the road to get ahead in their turn for the next trip,” he said. “The quality of driver training and testing, the enforcement of road rules and the safe design of roads to ensure safety of road users – especially pedestrians and cycle users who suffer more than 60 per cent of injuries and deaths – stand out as key indictments in the high road accident toll in Sri Lanka,” he said. National Hospital Deputy Director Dr. Kapila Wickremanayake agreed that lack of driver training and experience were major problems. “Other than training for drivers there should be some change in the attitude of the drivers, especially bus drivers, as they are mainly fighting for money and competition,” he noted. Roads were often dangerous for pedestrians because there was no separate pavement for walking, and people had to walk on the road along with passing traffic. Police media spokesman Buddika Siriwardena said motorcycle accidents had increased because riders travel at excessive speeds. He said traffic police were taking measures to track down such drivers and give them instructions. “Road discipline cannot be practised by the police alone,” he said. “Co-operation by road users is very important in order to control accidents,” he said. Police statistics show that for the first six months of 2013, there were 1041 fatal accidents and 1116 deaths. Last year, 42,145 accidents, 2317 fatal accidents and 2444 deaths were recorded. 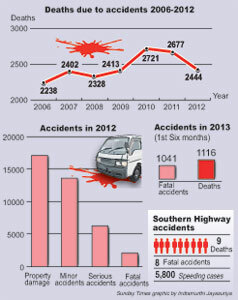 In 2011, there were 40,258 road accidents, 2498 fatal accidents and 2677 deaths. Alleged war crimes: How should the Govt respond?